Trendy Butler is a new menswear subscription. So new, in fact, that it's still in beta test mode. They're working out the kinks and sending some great quality clothing while they're at it. I've been consistently impressed with the quality of what has been sent to me, although not all of it has fit like I hoped. My husband, of course, being the guinea pig. If you're looking for stylish, quality menswear with what I consider a euro-style fit, this subscription could be what you're looking for. I feel like it's a very reasonable price for what you get. Please excuse my photos. I need a manikin to model these. See what I did there? Why? Because my husband doesn't want his handsome self on my blog and because these didn't fit perfectly. What You Get: One to three high quality menswear items worth at least $150 styled according to your profile and sent to your door each month. 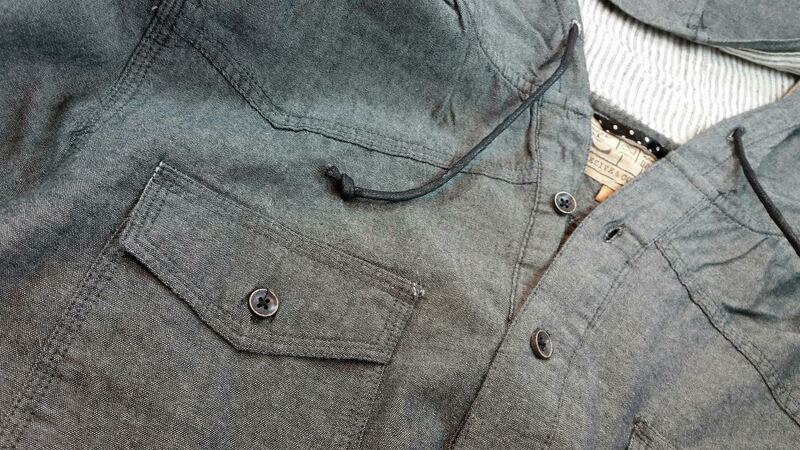 Cohesive and Co Kenetic Chambray Shirt in Dark Grey- I really liked this button up hoodie. Actually, I think I just like anything from Cohesive and Co at this point. Stylish but not too gaudy and the details are always well appointed. The inside of the hood and the wrist cuffs are striped. 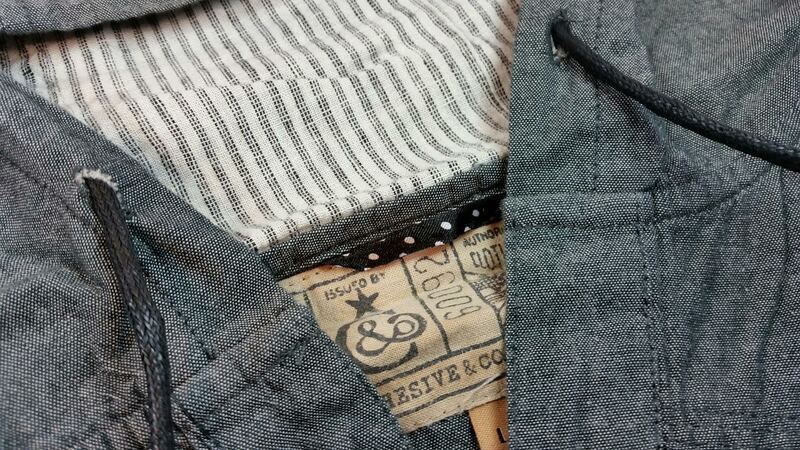 Everything else is a slate gray chambray material. Sort of stiff but not like a starched shirt. The only thing I didn't like was the weird texture of the drawstrings for the hood. Those have got to go. 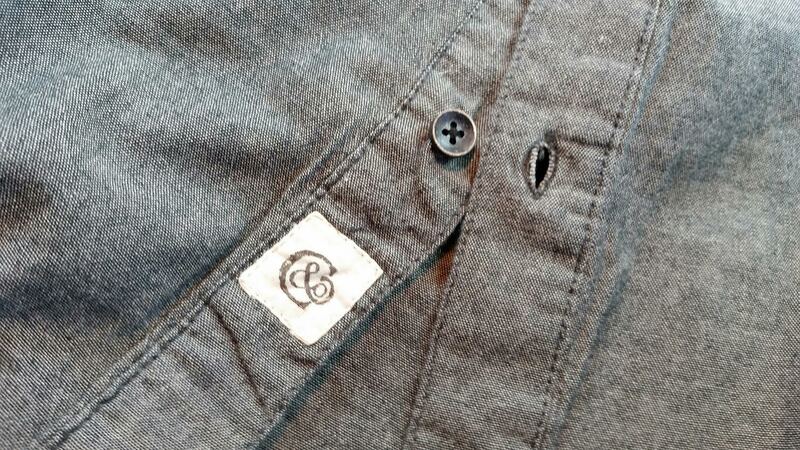 I loved the buttons and the stitching. I liked it so much I wished I was the one that got to wear it. Sadly, even though I had bumped up Walker's profile to Large, this still didn't fit. Usually it's his shoulders that call time on a shirt relationship but this time it was his chest. Those buttons were running away screaming. Normally he's a Medium although lately he's been bulking so Larges tend to be better but still! I wanted this to fit! 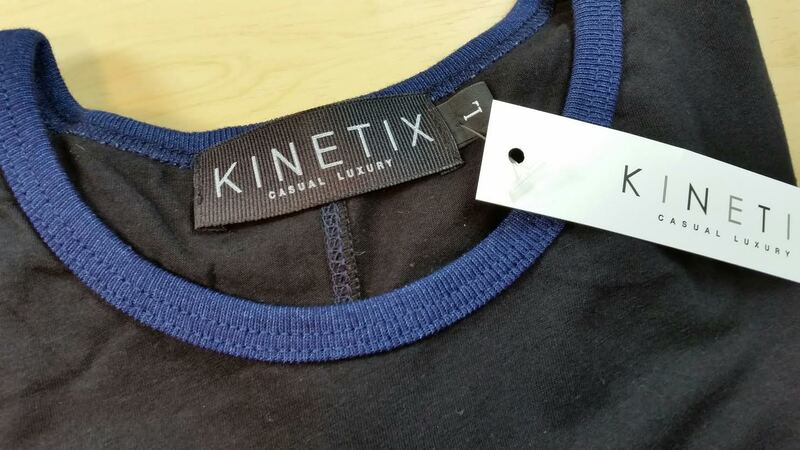 Kinetix Marcus Tee in Black- Kinetix makes a lot of t-shirts. It seems a lot of them have graphics but I marked no graphics on the profile so we haven't gotten any. This is sort of boring but I love the softness and the lightweight feel of it. 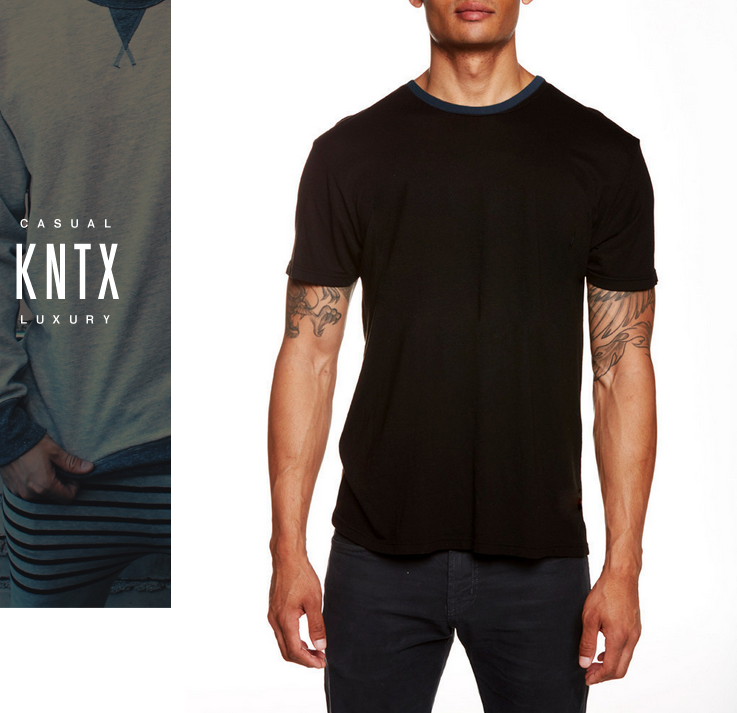 Since I'm so terrible at getting pictures of the entire shirt, you get the model guy from the Kinetix website. While it seems like a basic T-shirt, it does have a blue lined collar. Walker felt the collar was a little too big but I didn't see that it was a problem. But he's the one that has to wear it and if he doesn't like it then it won't work. 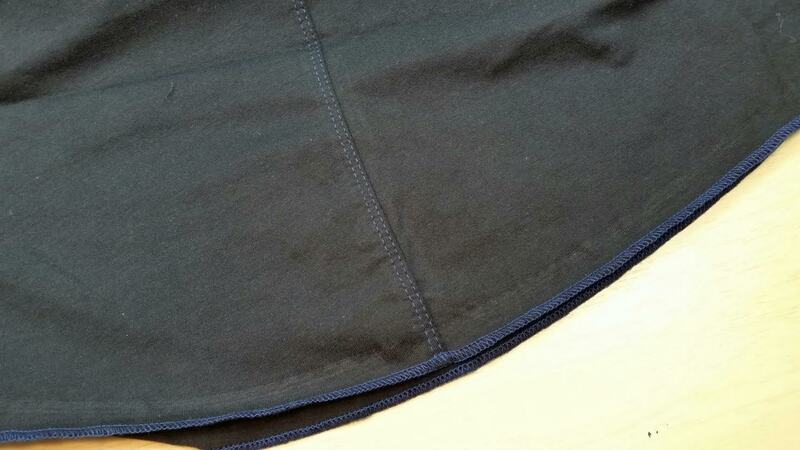 The back has a seam down the middle which I like and blue stitching around the hem. So not as boring or as basic as you might think. Plus I love how the fabric drapes. But the collar was a no go for Walker so this has to go back, too. 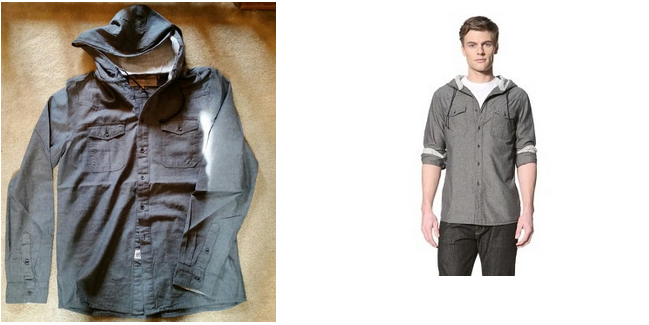 VERDICT: I'm beginning to think that Walker is the worst person in the world to get a clothing subscription for. I really like the quality and the brands that have been sent; I just wish I could get the sizing right. It's really nice that it's so easy to exchange items, too. I do have to say that after three months of boxes, I've gotten several Cohesive and Co and Kinetix items. They are both excellent brands and the quality is very good but I think I'd like to see a little more branching out. It could be that these brands just fit the profile I've chosen better than other brands. And Trendy Butler is technically still in Beta and procuring merchandise. The styles are perfect. I think the value is incredible, too. These are high quality materials and designs. 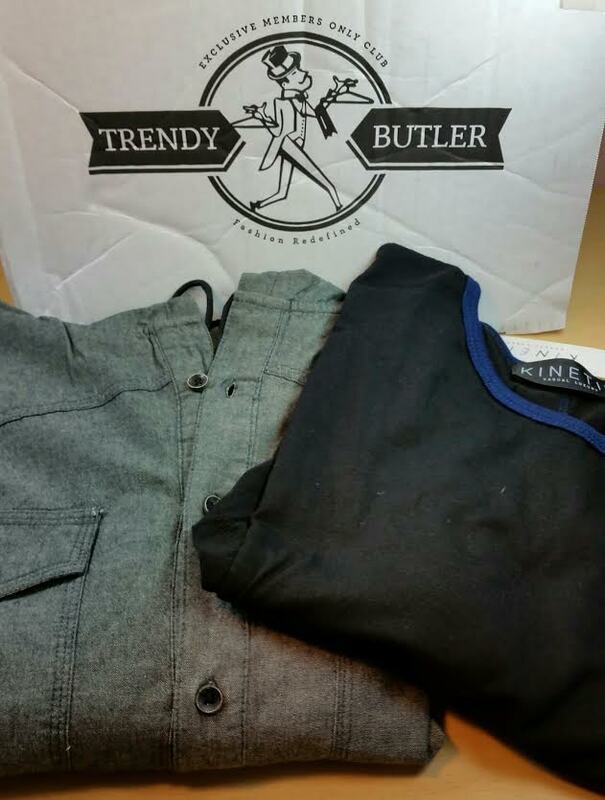 If you would like to sign up for Trendy Butler, head to their website at www.trendybutler.com. It's $55/month for life if you sign up now during their beta period. Use code BITS10 to get $10 off your first month. I'm not sure of the expire date on that. Here's what I have to say. Expect some bumps. Customer service response times are definitely getting better than when I first started. You can now access your own account on their site once you sign up. They've been really nice about my exchanges, providing return labels and all that. I was hoping I would receive the same items but in a different size and instead I received two completely different items. I wasn't really happy about that because I knew one size larger in those old items would fit. But I didn't ask for clarification and it doesn't really say anywhere whether to expect the same items or different. So now you know. Expect different items if you do an exchange. I did email to cancel just because we can't find anything to fit my 6'2", 190lb, broad shouldered, athletic husband! The cancellation had nothing to do with the quality of the items (VERY high), the brands or the styles. I think they run small and if you like the euro style cut, slim fit, etc, you'll fit into everything and look great. Hmm, this looks like a good box! I like their clothes. I hope they expand and add more brands as they grow. Also, seems like my boyfriend has the opposite problem of your husband. His upper body is average sized (not that I have a problem with it, just sayin'), but he has big legs from years of playing soccer so he can never find pants that fit lol.